….and along with a fun new Thanksgiving Dessert Recipe, I am also bringing back my Thanksgiving Prep Series that I ran last year. It is no secret that Thanksgiving is my ultimate FAVORITE holiday. I host it at my house every single year. Oh. And this way? I get out of having to host Christmas. I decided last year to do an entire Thanksgiving Prep Series, where I shared everything from my prep schedule, to each of my allergy-friendly Thanksgiving recipes, and right on down to my Thanksgiving Feast Master Shopping List. It was met with quite the response. I have never answered SO many Thanksgiving-based emails in my life. But, the rewarding part was afterwards when my inbox was filled with people telling me how the series helped them to get through the holiday without the stress or crazy kitchen mishaps or disasters. So, in addition to sharing this dangerously decadent Allergy-Friendly, Gluten Free Candied Apple Cranberry Upside-Down Cake, I am bringing back my Allergy-Friendly Thanksgiving Prep series! Annual CIAF Allergy-Friendly Thanksgiving Prep Series! PART 4: Gluten Free Cornbread/Bread Stuffing With Apples, Sausage, Pine Nuts and a secret ingredient that you will NOT want to leave out. PART 6: Toffee Pecan Caramel Apple Streusel (Gluten-free and Egg-free already, but ways to make this baby Dairy-free and Nut-free as well) and Crustless Pumpkin Streusel Pie. Now for this Candied Apple Cranberry Upside-Down Cake. As written it is Gluten-free and Dairy-free, and I also tell you how to easily adapt it to be egg-free and nut-free as well. And one of my favorite things is it is GUM-FREE with a perfect moist crumb. This cake is a wonderful end to a Thanksgiving feast. And your yummy topping will look FAR better than mine does here. Every time I make this cake, I line my cake pan with a round piece of parchment paper that fits just right into the bottom. It makes the cake come out of the pan perfectly. Of course, as I was making this cake again the other day, I had no parchment paper. And none of my neighbors were home to beg and borrow from. So I attempted to make it without. Do not do what I did. Use the parchment paper, people! Oh. P.S. The raw cranberries pictured below are for garnish only. I do not recommend feeding raw cranberries to your guests. Even my dog will not touch them…and that says a lot. 1. Preheat Oven to 350 degrees. Generally grease a 9 inch round cake pan. Using the bottom of your round pan, trace around the pan on parchment paper the exact size of your pan bottom. Cut the piece of parchment paper to fit just in the bottom of pan, without letting it go up the sides. 2. In bottom of pan on top of parchment, place the oil and then put in oven for 1 minute, until oil is fully melted. Then add sugar evenly over bottom of pan, mixing with oil. Place pan back in oven for 2-3 minutes. Remove from oven, sprinkle cinnamon over sugar, lay thinly sliced apples in a ring and place cranberries over apples. Place pan back in over for 3 minutes, or until it begins to bubble slightly. Remove from oven while finishing batter prep. 3. In medium bowl, mix together Superfine Brown Rice Flour, Almond Flour, Millet Flour, Arrowroot Starch, Baking Powder, Baking Soda, and Sea Salt. Whisk together until light and airy. 4. In bowl of electric stand mixer, beat Earth Balance Butter (or Regular Butter) and Sugar for 3 – 5 minutes until light and fluffy. Then add eggs (or Egg Replacer), one at a time, continue mixing. Add vanilla and mix again until incorporated. 5. While mixer is going on low speed, slowly add 1/3 cup of the milk then add 1/2 of dry ingredient mixture. Then another 1/3 cup of the milk, and the remaining half of the dry mix. Finish with the last of the milk. Stop occasionally to scrape down sides with rubber spatula. Once all dry mixture is added, continue to mix until well-incorporated and batter seems light. 6. Pour batter over apple-cranberry mixture. 7. Bake for 30-35 minutes, or until toothpick comes out clean. Let cool for 5 minutes, then invert onto plate. Remove parchment paper from cake top. Top with homemade Coconut Whipped Cream. And for even more Dairy-free Whipped Cream Recipes and resources, visit Go Dairy Free. This cake looks wonderful. I just submitted my recipe for the roundup as well. Yay! Thanks so much for joining in, Valerie! Those collard greens look amazing! 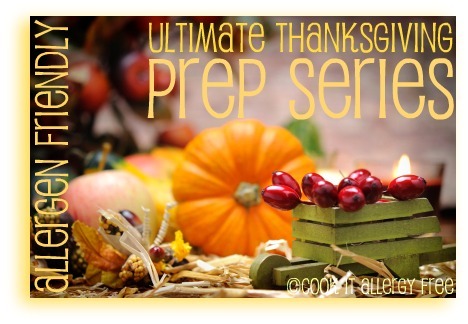 I’m so glad you’re bringing back your Ultimate Thanksgiving Prep series! It will help so many people. Your cake looks incredible…want to send some to Texas? Thanks for hosting A Gluten-Free Holiday this week, Kim! Thanks Hallie! And I just love your idea for baked turkey croquettes. I am so going to do that with our leftovers this time! The cake looks delicious! Thanks for sharing and thanks for the giveaway! Also Thank you for the giveaway chance! We love Asian food, and just beginning the gluten free path has made enjoying it confusing at best. I can’t wait to try this cake! I love apples and cranberries together! I am SOOO making this right now, to teach at my Gluten Free Thanksgiving Cooking class tonight. I will be directing people right to your blog! And the comment about your dog not eating the raw cranberries made me laugh right out loud! Thank you Kim!!!! Wow, this cake looks amazing (even if you didn’t have the parchment paper)! I’m Canadian, so we celebrated our Thanksgiving already, but I’ll definitely be bookmarking this recipe to use next year… or I may just make it anyway because it looks so tasty. I love cranberries! It’s so interesting to see so many different ways you use them. Delish! I am so excited to look through all these Thanksgiving recipes, as these are the first holidays where I need to accomodate my son’s allergies. And posted it on facebook too. Would love to get this book so I can start trying to make Asian style food. It seems difficult since soy is used so much, but I’m sure there have to be some alternatives. Sara, I use Bragg’s Coconut Aminos all of the time in place of soy sauce and it really does impart a really similar flavor!! We do not do soy sauce either! And you will love the book! It has so many good ideas! Thanks Wendy!! So glad you are still making those cranberry muffins. Those are a big favorite in this house. I just made them with a twist last week. I got some persimmons in my bountiful basket so I made persimmon cranberry muffins with that recipe and replaced the bananas with persimmons. Holy moly. They were SO good! I so very much miss steamed dumplings. I’d love this book so I can enjoy them again. thanks! I linked up, but don’t enter me. Already have the cookbook. BTW, the cake looks beautiful. GORGEOUS cak, Kim! Oh, to come to your house for Thanksgiving … that would be heaven! Love your recipes that you shared, Shirley! Two for one is always a good idea in my book. And if you and Mr GFE showed up at my house for Thanksgiving, it would seriously make it the best holiday EVER!! This looks like the perfect dessert for Thanksgiving! Definitely a great flavor combination to celebrate the holiday. I would love to win this book! I am loving all of these holiday recipes. Cake looks delicious. I’ll be trying it this weekend. My husband loves cranberries, and so do I. Thanks for the great recipes. Gaile, I love the look of that recipe. It would be a dangerous dangerous thing to make in this house. Would be gone in minutes. Ricki, if anyone can reproduce this cake for your diet it would be you!! 😉 You are one of the most creative recipe developers I know! We have such amazing traditions in my family over Thanksgiving. We eat dinner at my Grandmothers, gather up the entire family and chop down our Christmas Trees in the woods (in our small MN town) then go have pie and hot cocoa and my house. Afterward we play Bingo with prizes that my Grandmother collects throughout the year and wraps for us….then we make popcorn and watch a movie! Every year, this is what we do. Every year it is the time I most look forward to. Now to make the FOOD more gluten-free will be the challenge. Oh my goodness! Molly, your Thanksgiving tradition sounds absolutely special in every way. i can completely see why it is so important to you and why it holds such a special place in your heart! And I just love the idea of the bingo game with gifts that your Grandmother has collected! Thank you so much for sharing your tradition with me! Kim this is stunning! You’ve done it again, you’re such a good recipe developer! Thanks for making the every-allergy-friendly adaptations! i think this would make a fantastic Thanksgiving brunch addition too! With a small note that read, DO NOT EAT THE CRANBERRIES, DECORATION ONLY! My mouth is secreting acidic juices right now! 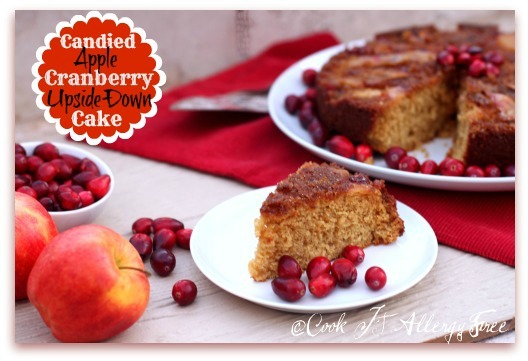 Your Candied Apple-Cranberry cake is delicious! I also added some orange zest to the batter. Looks like some really good recipes here. Too busy to look right now, but will have time this weekend to look them over when I can enjoy them. This cake sounds delicious, will have to try it. Love the book, and a chance to win !! Hi. Below is a link to a recipe on my blog for vegan gluten free corn pudding. It’s a family favorite and a very easy Thanksgiving dish. I am really looking forward to this series… and I’d love a copy of the gluten-free Asian cookbook. We’ve really been missing Asian foods! love this! i’m so happy to have discovered your blog. i would be thrilled to win the book! The cake looks awesome! I’m new to the dairy-free world, thanks to my son’s dairy sensitivity–he’s 7 weeks. I love finding new blogs with recipe ideas–thanks for yours! Shared on twitter. I’m @maryhorowitz. Wow. All these recipes look amazing! Thanks for sharing. The cookbook looks awesome too! Want to send some of that cake to me as a care package? I have a copy of the book – love it so you don’t need to enter me, just came by to beg for cake! the cake looks fabulously lovely. this is going to be fun reading everyones favorites! I have started looking at gf recipes that are also sugar free or nearly sf since my diabetic brother was diagnosed in January of this year with celiac disease. He finally has the answers for his misery! We don’t live close to each other and I’m trying to put together a cookbook of recipes that I’ve come across that sound good and that he can eat and enjoy. The cake looks fabulous and I have some other friends who are gf who can get this for the Holidays. Actually, maybe I’ll add it to your roundup right now (because it is REALLY tasty). Love cranberries in all sorts of things! I just posted about this give a way on Facebook. I just tweeted about your give a way. I would really like to win that Asian cookbook. Gluten Free style! By the way, your cranberry and apple upside down cake looks amazing. What a great idea with that combo. I bet the sour with the sweet gives it such a delish taste! Thanks for sharing this recipe – cranberries are one of my favourite things about the holiday season. Good luck to everyone else who is entering the contest! It would be awesome to win a copy of your Asian Kitchen cookbook. and the photo of your Apple Cranberry Upside Down Cake is making me salivate for this apple and cranberry dish. These recipes look great and for someone who was recently diagnosed the holidays will be difficult to navigate (that and I really love Asian food and that is even harder to give up than the holiday food). That cake looks so yummy. I can’t wait to try the recipe! Sharing with all my facebook friends these wonderful recipes. New to gluten free. But also have three in my family who cannot have dairy, eggs or cane sugar. It has been a struggle but very thankful for your website with recipes. The cake looks amazing! I would love the cookbook. I really need some new recipes! Also linked up my vegan Tiramisu Pancakes. with glutenfree option.. a must his holiday season! Even with a stuck bottom/top it looks lovely! Love Asian food- a gf asian cookbook would be great to win. Thanks for hosting. I shared Pumpkin Ice Cream-Dairy Free! I would like to do more asian cooking. I use my electric wok all the time, but my family doesn’t like my stirfries since I went gluten free. This is one giveaway that would really improve my life! I’ve seen the Asian cookbook at my local natural foods store! Would love to win it! Thanks! Just tried the Candied Apple & Cranberry Cake. Substituted agave syrup for the sugar (decreased milk by 1/4 cup) as I don’t use any refined sugars. I also used dried cranberries instead of fresh and quinoa flour instead of millet because I had them both on hand. It turned out ABSOLUTELY amazing. The cake is light and fluffy with just a hint of cinnamon! Even my husband loved it (he’s not gluten-free). Thanks for a new favorite recipe! Yay, Marcy!! These types of comments seriously make my whole day! Thank you so much for coming back and letting me know how it turned out for you! I love your substitutions. I also love that you used the quinoa. A little extra health benefit! 😉 Thanks for the report! Loved the comment about not serving the cranberries to your guests or dogs…but my dogs actually do love frozen cranberries! My crazy dogs love just about any fruit or vegetable. I’d love to cook from this cookbook — just this weekend, I went out for Japanese and was so jealous of my friend’s dumplings! I’d love to make gluten free dumplings on my own!! Thanks for offering the giveaway!! I’ve been craving Laura’s cookbook for almost 2 months! Hoping to win it! Love your blog! I linked to your post from my Twitter account and I can’t wait to find out if I won that fabulous cookbook! My favorite holiday tradition is family! Being with family and cooking! My mother and I would stay up nights holding together Christmas Houses made of delicate butter cookies and talking. I now have perfected the recipe and have turned it into a business. They are not Gluten Free, but I love seeing the kids enjoy them. For me, I am still figuring out Gluten Free baking. In the meantime I make a great Gluten Free Apple Pie, Stuffing, Gravy, and with Turkey and Rice…no one knows I am eating that different from the rest of the family! Your cake looks amazing. 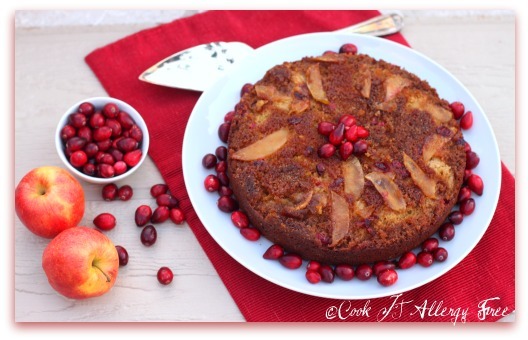 I made a cranberry ginger upside down cake recently – love how pretty it looks with all the fruit on top. I’d love to win that cookbook! My friends brought chinese food to school today and I was just thinking about how much I’ve missed it since going GF. Hi! Just wanted to let you know I included your cranberry cake recipe in my post, An Allergy Friendly Thanksgiving Menu — linked back to you and everything 🙂 Have a great holiday!